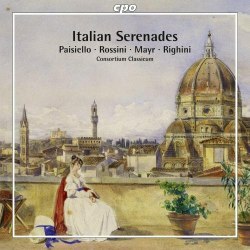 The whimsical title Italian Serenades given to this CD is effortfully explained in the notes by Luigi Magistrelli. He implies that this is the music of happy Italians enjoying a social evening. Three of the composers were Italian and two of the pieces, the first and last, are serenades. The musical forms of serenades and divertimentos evolved for outdoor performance. Since most aristocrats kept a certain number of musicians as part of their households this sort of music was in demand much as a disco might be required today as background to a social gathering. Not too much was expected regarding quality presumably since few present were actually listening. Mozart railed against his status as a servant but managed to write supremely fine wind serenades. Giovanni Paisiello was a respected composer of operas. The first large-scale work on this disc was arranged from his still-performed opera The Barber of Seville by Johann Wendt a Bohemian oboist who not only composed but also transcribed quite a lot of operatic repertoire for this sort of ensemble. Since Paisiello's music is quite attractive, this first item gives some pleasure and might encourage some to try the entire opera - a good recording exists on Hungaroton conducted by Adam Fischer. The Quintet supposedly by Rossini is very brief and tuneful enough. The remaining pieces are a reminder that other composers at the time of Mozart and Haydn were busily composing in the same or a similar style but mostly with little inspiration to offer by comparison. The German composer Simon Mayr did gain quite a substantial reputation in Italy for his operas but the arrival of Rossini on the scene caused his star to wane. Vincenzo Righini was Italian but worked mostly in Germany and Austria. His turgid serenade really does not justify one's time. The Consortium Classicum are a collective of string and wind players mostly drawn from German orchestras. Here a group of wind players do their best with music that is really only of interest to specialists. It is hard to recommend this to the general music-lover when so much wonderful music of this sort by such as Mozart and Haydn is available. Had the recording been beyond the very ordinary it might have lightened the listening load, but it is not. There is no sense of space around the instruments and very limited depth to the sound overall. A very tired issue that can safely be ignored.